It was perfect weather on Saturday as Kathleen and Auston exchanged vows in Abigail’s Garden at Abernathy Center. 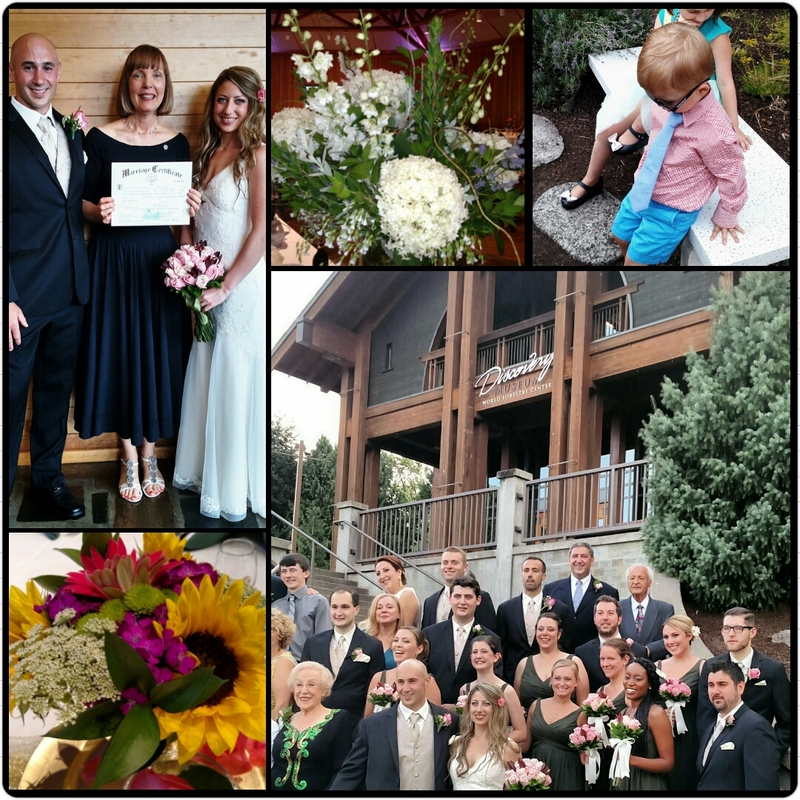 Sweethearts for seven years, the couple were cheered by friends, family, coworkers and their ten member bridal party. The ceremony, held in the garden gazebo, included a wine goblet ritual and heartfelt vows written by the couple. 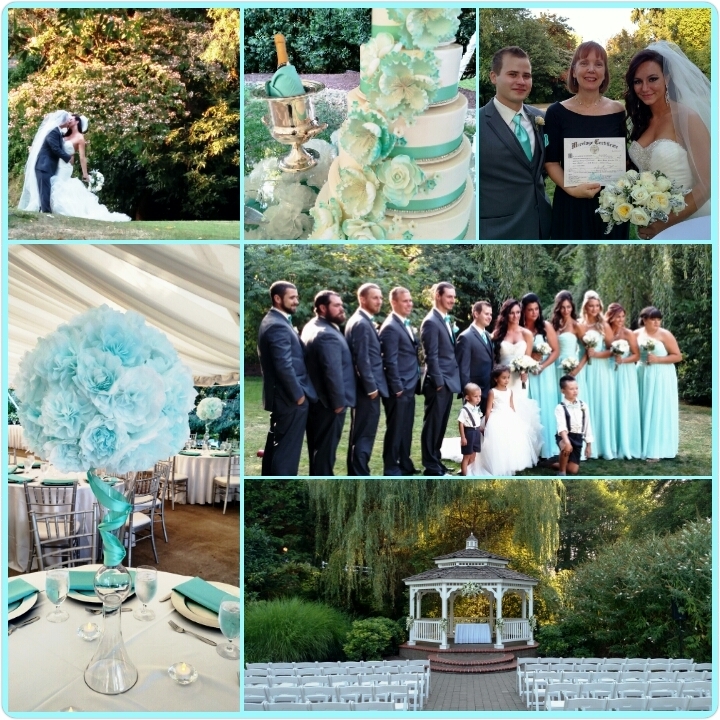 Tiffany blue was the dominant color of the day showcased in every lovely way from gowns to wedding cake (five layers of different flavors from Beaverton Bakery). The fabulous DIY centerpieces featured giant pompoms crafted from coffee filters and dyed what else? Tiffany blue. Following the ceremony, guests enjoyed a specialty soda bar and scrumptious appetizers including caprese skewers, crab cakes and strawberry/cheese/balsamic pastry puffs. Dinner was served under the big top followed by fun on the dance floor courtesy of the DJ from Bust A Move. The newlyweds will honeymoon in Cabo before returning to their Gresham home. Congratulations Mr. & Mrs. Haskins! May your marriage be graced with love and laughter. Family members with roots in three continents celebrated the marriage of Sonja and Javid yesterday at the beautiful World Forestry Center in Portland, OR. The groom’s father was born in Iran and the bride’s father was born in France. The mother of the bride hails from Connecticut and Javid’s mom was born in Louisiana. Alumni friends and family made up the fourteen member bridal party which featured the girls in hunter green chiffon with pink rose bouquets. The guys wore elegant black tuxes with champagne ties and vests. Gifted pianist, Andrew Ross, enhanced the ceremony with heartfelt music. Afterward, guests enjoyed happy hour on the patio followed by a lavish buffet dinner served by Dalton’s NW Catering. The newlyweds will spend the weekend in Portland before returning to their home in Renton, WA. They plan to honeymoon in Iceland next year. Congratulations, Mr. & Mrs. Yamin! May the joyful energy of your wedding day fill your hearts forever.